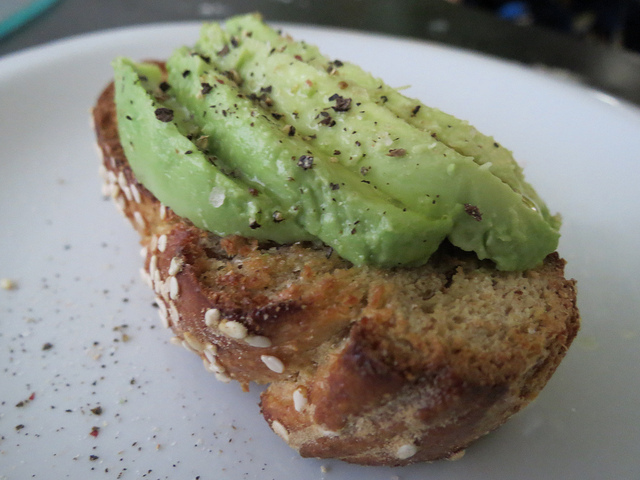 This challah is incredible on its own, but my favorite way to serve it is sliced and toasted, and topped with a generous layer of ripe avocado, a drizzle of olive oil, sea salt and cracked pepper. The last 2 weeks have been insanely busy. As the premiere of Young & Hungry creeps closer (June 25 at 8/7 Central on ABC Family -- set your DVR! ), there is so much to do to get ready. Most recently, that has included shooting a web series cooking with the cast. 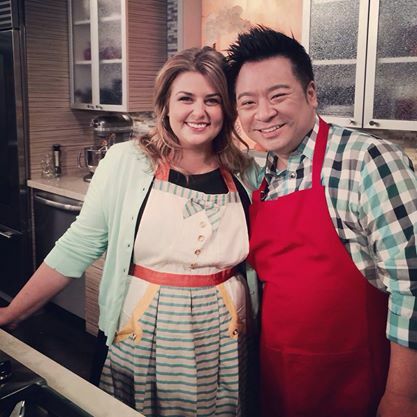 Check it out: that's me cooking with Rex Lee, of Entourage fame! But all that excitement has also meant a lot of time spent away from my cozy little San Francisco kitchen, and whenever I've been away from home for an extended period of time, the first thing I want to do when I get back is make challah. OK, that's not exactly true. The very first thing I want to do is see Evan. But after that, I want to make challah. Warm homemade challah for Shabbat dinner, to be repurposed the next day as French toast or panzanella. Making challah centers me. It takes some time, so it forces me to carve out at least a couple of hours to devote to this special task. As I mix the eggs and flour and oil, and knead the dough, my worries melt away and I shift my focus to the weekend ahead. Tonight, I'm switching things up and, instead of my usual Olive Oil Challah, I'm making this heartier, healthier whole wheat challah, made with honey rather than sugar. I like to use dark amber honey to really emphasize that component of the flavor. The combination of the honey and nutty stone-ground whole wheat flour yields a rich brown dough. Additionally, while most challah recipes call for canola or vegetable oil, I generally prefer the flavor of extra virgin olive oil. Not only is it a healthier fat, but the flavor survives the baking process and adds much depth to the finished product. 2 cups whole wheat flour $2.50 for 32 oz. Line a baking sheet with parchment paper (or dust with flour, or grease with olive oil). Set aside. Combine the water, yeast and 1 tablespoon of the honey in a mixing bowl. Stir well to combine. Cover the bowl with a clean dish towel, and let rest for 5-7 minutes, until bubbles appear on the surface. Gently whisk in the remaining 1/4 cup of honey, olive oil, and 2 of the beaten eggs. Stir in the flours and salt until you have a cohesive dough. Knead dough on a floured surface (or in a standing mixer) until it becomes somewhat elastic (2-3 minutes in the mixer, 5-6 minutes by hand). Please note: the dough will not be springy and soft like regular challah--it will be somewhat dense. This is okay. Gather the kneaded dough into a ball and put it back in the bowl you mixed it in with enough oil to coat it well. Cover the bowl with a clean dish towel and let rise in a warm spot (like an oven that has been brought to temperature and then turned off so it's warm, not hot). Let the dough rise for 1 1/2 to 2 hours, until doubled in size. Once risen, gently punch down the dough to deflate, and transfer it to a lightly floured surface. 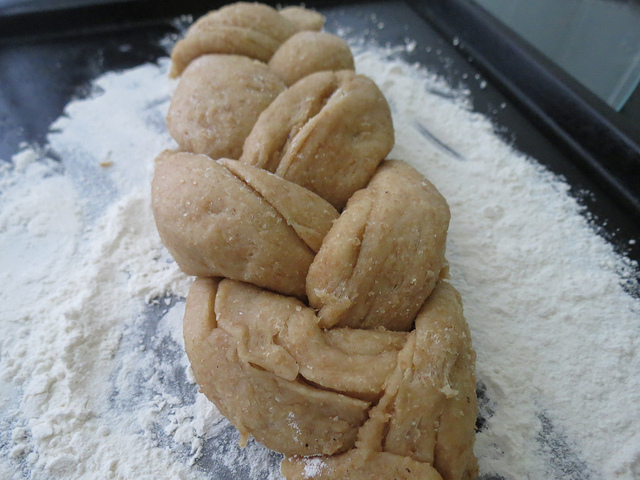 As I've stated before, there are a few ways to go about weaving the challah. You can do it the Deb (of SmittenKitchen) way, the Tori of The Shiksa in the Kitchen way, or you can do it the Gabi Moskowitz, 1989 Graduate of Beth Ami Hebrew School Sunday Challah-Making Class way, which is to sort of braid it like you would hair, and then tuck the messy bits under so no one can see them. You can find my step-by-step tutorial for this approach with photos here. You can make 1 large braid or 2 smaller ones. Once the dough is braided, place it on the parchment-lined or floured/greased baking sheet. Cover the braid gently with lightly greased plastic wrap, and let rise in the turned-off oven for 1 hour. Take the dough out of the oven, and preheat the oven to 375 degrees F.
Once the braided dough has risen, use a pastry brush to coat the top with the one remaining beaten egg. Give it 2 or 3 coats. 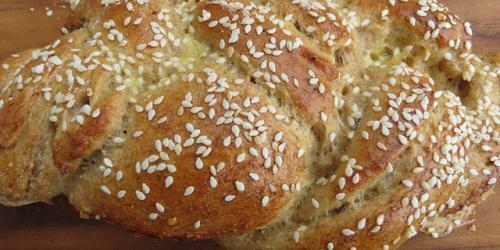 If desired, top the egg-washed dough with a sprinkle of sesame seeds. Bake the challah(s) for about 30 minutes, until deep golden brown. In anticipation of the new tv show Young & Hungry decided to check out your blog and try out this recipe. I have to say it was delicious! My family isn’t a fan of sesame seeds so I substituted them with oats instead which I think commitments the whole wheat flavor. Delicious recipe! I hope the chance to visit this blog is a great benefit for me. I would like to my own recipes in my kitchen always. From this post I could get many new recipes. I want to definitely try it out in my kitchen. I have been visiting many posts, but found this one amongst the best and enjoyed reading it a lot. Look what i got free gold membership. best and simplest method to get free codes from xbox. Visit and get codes for free just by clicking on the generator. These codes can be generated in limitless amount. Get free membership for enjoying all the services of xbox over internet. Looking for xbox live codes for making gaming more exciting over xbox, Visit the mentioned website to get xbox live codes for free, and also grab other offers from xbox. These are amazing platform for gaming, real, and very exciting. It provides a real experience of gaming over internet, Very beneficial for all xbox lovers as all offers are free and also get access to live online xbox. From this post I could get many new recipes. I want to definitely try it out in my kitchen. Yes! That will work beautifully. What a receipe you have got there.Love it. Today I spend my three hours to search something interesting for my research and finally I got those information from here..! nice Post ! its interesting. thank you for sharing…. With more than 10,000 domains under management of PK Domain, we are the one of the most reliable web hosting providers of Pakistan. Our hosting packages are much economical, which are in everybody reach ranging from the Web Hosting in Pakistan for professional websites, business hosting for the small-oriented business circles to professional web hosting for larger organizations. Visit PK Domain to get information about cheap domain hosting prices. Very amazing,I research Your Blog About Your Topic Very Excellent Post You Discuss With Us.! Thanks for the post! Our mechanical engineering assignment help expert are really happy. Daily I visit most of the web pages to get new stuff. But here I got something unique and informative. Thanks for sharing this amazing blog.